GIVE ME THE BANJO, a documentary presented by UNC-TV North Carolina, aired in 2011 as part of the first season of PBS Arts Fall Festival, a multi-platform event anchored by nine films that highlight artists and performances from around the country. 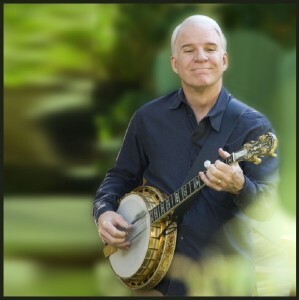 Narrated by actor/comedian/banjoist Steve Martin, and guided by modern banjo masters such as Earl Scruggs, Pete Seeger, Bela Fleck, Mike Seeger and Abigail Washburn, GIVE ME THE BANJO explores American music from minstrelsy, ragtime and blues, folk and bluegrass. In addition to musicians, a mix of folklorists, historians, instrument makers and passionate amateurs tells stories of America’s instrument in all its richness and diversity. Rare stills, first-hand narratives, archival footage and recordings of historic banjo figures surround and expand on the expert commentary. GIVE ME THE BANJO was directed by Emmy® Award-winning writer/producer Marc Fields. Banjo master Tony Trischka, one of the most acclaimed acoustic musicians of his generation, served as music director. Michael Kantor served as executive producer. Nine years in the making, the production traveled to 14 states; more than 350 hours of interviews and performances were filmed. A wealth of musical and historical content beyond the broadcast program are the foundation of a web-based archive (www.thebanjoproject.org) that will serve as a cultural gathering place for exchanging knowledge and news about the banjo.